The honourable Prime Minister of India Shree Narendra Modi has taken quite a few steps to provide a moderate living standard to the people who live under poverty line. After housing development, Krishi Yojanas and stand up India, now he has introduced a Pradhan Mantri Ujjwala Yojana for the rural poor people. The scheme was launched in the first day of the month of May this year. Applicants will get a free LPG connection in their houses. The main agenda of the scheme is to provide a clean fuel for cooking to rural people. The applicant should have a saving account with any of the nationalised banks. If the applicant or anyone from her family already owns an LPG connection then she will not be eligible to apply for the scheme. Candidates can apply through offline as well as online. Offline applications are available in all the LPG distribution centres in the country. The woman applicant can get the application form from the nearest LPG distributor free of cost. On the other, this 2 page application form is also available online. People, who can have internet access in their area, can download the form and submit it online after filling it up. There are some basic information such as name, address, Aadhaar number, Bank account (or jan dhan) number, phone number or other contact details, need of cylinder 5 kg or 14.2 kg and so on, that are needed to be given in the form. At the time of submitting the application some important document must be produced. As the women households are massively engaged in cooking, they will suffer the most by using unclean cooking fuel. The scheme certainly provides a healthy life to the women households and also to the children. 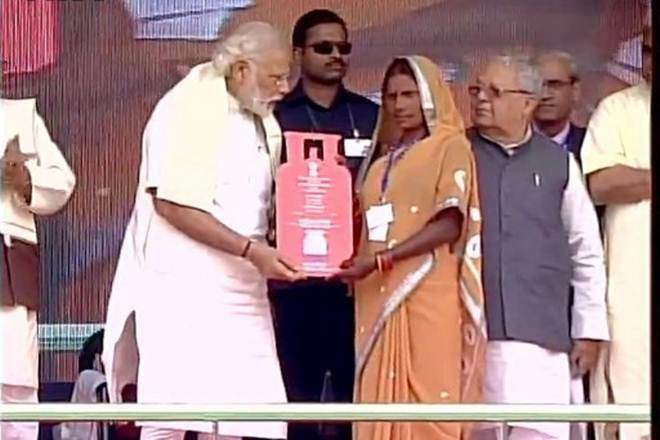 According to the scheme people who are living below the poverty line will get a free clean fuel i.e., LPG connection in their houses. The scheme will promote women empowerment as the scheme is initiated for the women only. Only urban and semi-urban households are enjoying LPG connections in India, now rural people will get to use it as well. The scheme is for the BPL card holders only. There are so many rural families who don’t carry a BPL card yet they use fossil fuel in their houses. It causes massive health issues among the women and children of those families. According to the scheme applicants must have a saving bank account to receive the subsidy. But most of the women who live under poverty line don’t have any bank accounts. The forms are available in LPG distribution centres, but some of the remote areas don’t have LPG distribution centres. For any related help one can contact ministry of petroleum and natural gas. The LPG helpline number of the concerning person is 011-2338-7404. Also one can drop a mail mentioning his / her query. The mail ID is mahesh.png@gov.in .